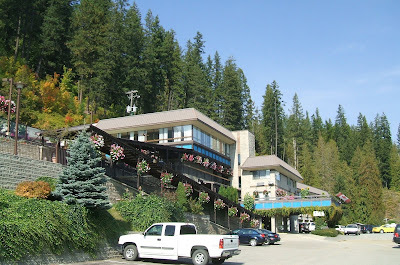 Ainsworth Hot Springs, B.C. (pop. 100) is approx. 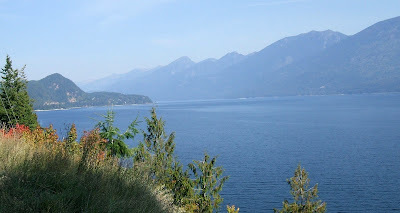 47 km (28 mi) north of Nelson, B.C. on Hwy. 31. Long before our RV'ing days, we were among the many visitors coming to the natural hot springs. That was in the 60's when there was only a simple pool and the horseshoe shape caves were so dark, you only hoped you wouldn't step on someone sitting in there enjoying the heat of the water. The unique caves offer the natural hot spring water with soothing minerals. The resort there today has a hotel, restaurant and gift shop and Ainsworth appeared to have some shops developing to browse through on our next visit. At the height of the mining days, Ainsworth was home to 3000 people and six hotels. Mining declined and fire destroyed most of the town but the Mermaid Lodge and Motel was spared and is still there to this day. Thanks for your kind words, Merryann. It's wonderful to visit those great memories!